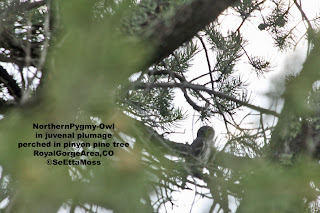 Today I did some birding in the pinyon-juniper habitat around the Royal Gorge (a deep canyon through which the Arkansas River runs just before it gets to Canon City). I saw birds expected in this habitat including 2 Gray Flycatchers. 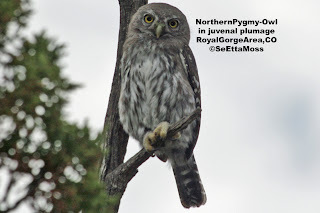 As I drove slowly along a gravel county road looking for birds I spotted the Northern Pygmy-Owl in these pics. 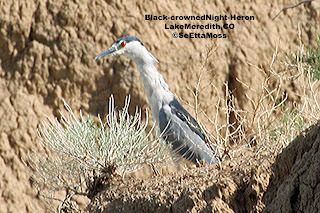 In addition to checking Lake Henry yesterday, I checked nearby Lake Meredith and found 5 Snowy Egrets, the adult Black-crowned Night-Heron in this pic (please note that the bulging red eyes are real and not an artifact of photography) and a juvenile Black-crowned Night-Heron. 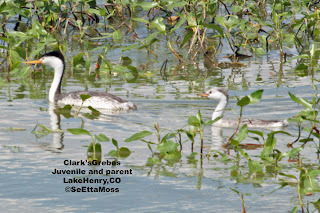 There were some Western and Clark's Grebes swimming around the lake but none with young. There were also distant white headed gulls. 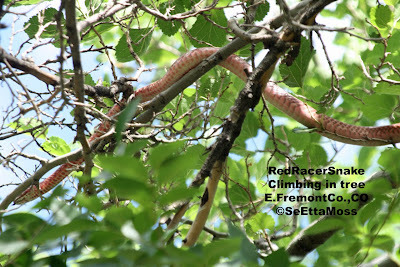 So here I am, spotting the snake which was about 20-25 feet up in this tree, watching the snake slither over branches as it moved around adeptly. I had been aware previously that snakes climb trees but had never seen one until now.And this snake appeared more concerned about me than about the Bullock's Orioles that were screeching at it. In fact, this snake appeared to stop it's movement to look directly at me, as shown in the bottom pic. This was more than a little disconcerting to me--yes, I knew it was not going to jump on me, but I am frightened of snakes and to have one in tree branches above me stop to look directly at me was just kind of creepy. Birders learn to pay attention when birds are agitated as this may be an indication that a predator is nearby. Usually that predator is a raptor, and sometimes we can find owls this way. So today when I saw 2 male Bullock's Orioles behaving in an agitated manner, I was drawn closer to see why. I thought it possible that one of males might be upset that the 2nd male was near it's nest, but it seemed more than that. 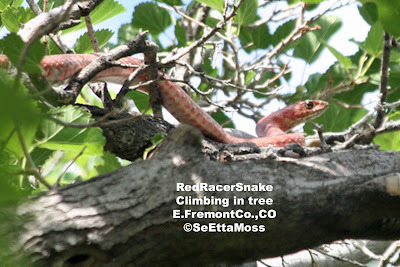 I watched closer and soon saw the object of their anger--a Red Racer snake (referred to as a coachwhip snake in Amphibians and Reptiles in Colorado by Hammerson). And it was in the tree that they were in!! !